(CNN) -- A suicide bomber killed at least 14 people and wounded more than 50 others Tuesday when he targeted a procession heading to a mosque in southern Sri Lanka, the country's official news agency said. 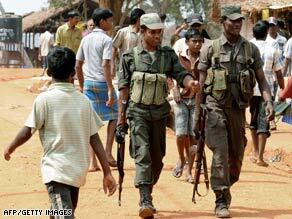 Sri Lankan soldiers patrol a shelter for war-displaced Tamils in Vavuniya in late February. A government minister was among those critically wounded in the blast that officials blamed on Tamil Tiger rebels. The attacker rode a motorcycle toward the procession that was making its way to a mosque in Akuressa to attend Milad-un-Nabi celebrations, the news agency Lankapuvath reported. Milad-un-Nabi observes the birth of the Muslim prophet, Muhammad. The procession included six government ministers and several local politicians, police said. Mahinda Wijesekara, the minister of posts and telecommunications, suffered head injuries in the blast. He was in critical condition, said Dr. Aruna Jayasekera of Matara government hospital. Akuressa is located about 27 km (16 miles) from the coastal town of Matara. The attack came amidst an intense military push in the northern Mullaitivu district to rid Tamil Tiger rebels of a small stretch of land they are still dominating. The rebels have fought for an independent homeland for the country's ethnic Tamil minority since 1983. The civil war has left more than 70,000 people dead.